over 150 youths employed by MALA Construction in Kapiri Mposhi District May 20th locked the ZR Terminus Offices at Kapiri Mposhi railway station demanding for payment of their salaries. The irate youths disrupted operations at the terminus as they blocked ZR workers from entering their offices. Group Representative, Mathews Chinyimba said the workers have not been paid their salaries for four months now by the contractor hence their action. Mr. Chinyimba said the workers are each owed an accumulation of K 6,000.00 in monthly salaries over the four months. 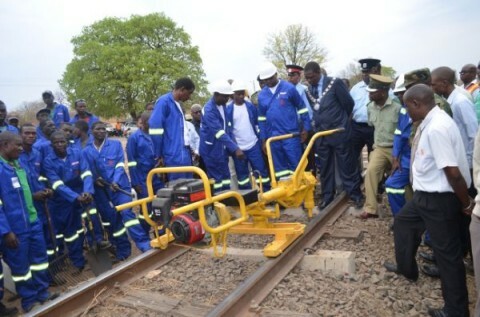 MALA Construction was recently engaged to rehabilitate the Zambia Railways (ZR) railway line, in the District. According to contractual agreement signed with the contractor the workers are each entitled to a K 1, 500.00 monthly salary. The workers have since downed tools and have vowed not to unlock the ZR offices until they are paid the money. “ We are not going to take any more excuses because we have worked for this money,” Mr. Chinyimba said. Mr. Chinyimba said the workers who have been camping along the railway line since the commencement of the project over five months ago were facing challenges in feeding themselves because of nonpayment of salaries. He said the Contractor had abandoned them in the bush after failing to pay them their salaries and appealed to government to intervene in the matter accusing MALA Management of conspiring with ZR not to release the funds for their salaries. “Something fishy between ZR and MALA is going on because other companies implementing the same project are normally paying their workers but why has it been a challenge with”, Mr. Chimba wondered. ZR Management refused to issue a statement on the matter while MALA management could not be reached for a comment by broadcast time. Over 500 youths, in Kapiri Mposhi alone, have been employed by the eight contractors that ZR has engaged to rehabilitate its railway line using funds accessed from government’s Eurobond.